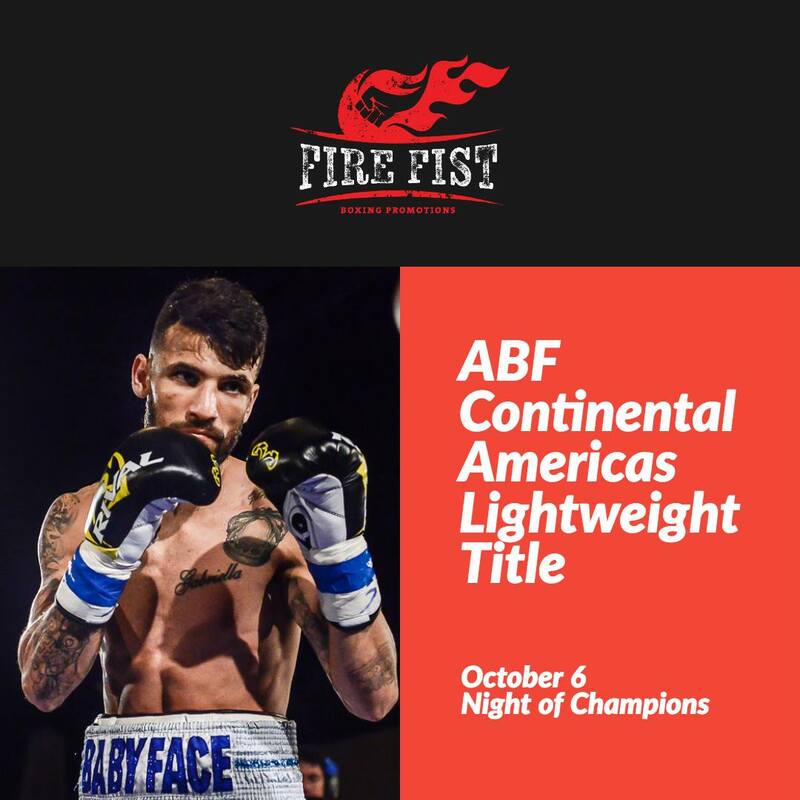 Lightweight William “Babyface” Silva returns to the ring Saturday, October 6 when he meets hard-hitting Jose Forero in a ten round contest headlining Fire Fist Boxing Promotions’ “Night of Champions” at the St. Petersburg Coliseum in St. Petersburg, FL. Tickets are on sale by going to http://www1.ticketmaster.com/fire-fist-boxing-presents-abf-triple-st-petersburg-florida-10-06-2018/event/0d00551696349f20. VIP tickets can be purchased by calling 813-734-2461. Born and raised in Sao Paulo, Brazil but now fighting out of Plant City, FL, Silva has an outstanding 25-2 professional record with 14 knockouts. On July 14, Silva showed incredible heart and determination but lost via sixth round stoppage against elite rising star Teofimo Lopez. Prior to his gutsy effort vs Lopez, Silva shutout veteran Rogelio Casarez over ten rounds to capture the IBO Continental 135 pound championship. Living and fighting out of Panama, Forero is a former WBC Latino and Global Boxing Council champion, capturing both belts by stoppage. Forero, 13-7-1 (11 KO’S), is confident Silva will be his next victim and doesn’t plan on leaving it up to the judges. Silva-Forero is for the vacant ABF Continental Americas lightweight title. Popular welterweight up and comer Mark Reyes Jr. of Tampa challenges experienced Panamanian Edwin Gamboa in an eight rounder for the ABF Continental Americas welterweight title. A multi-time champion as an amateur, Reyes has shined thus far in the pros, compiling a perfect 7-0 record with 5 wins by knockout. Reyes appears to be a star in the making however he’ll be facing his toughest foe to date. A 20 fight veteran, Gamboa’s 11-9 with 6 wins by KO. The 33-year-old Panama City native’s faced five unbeaten opponents and handed two their first defeat. Former world champion and St. Petersburg native Noemi “La Rebelde” Bosques returns to her hometown for the first time in more than two years to face ultra-tough Crystal Hoy in a six round super flyweight contest for the ABF Continental Americas title. Since turning pro in 2012, Bosques traveled the world to face many of the sport’s top fighters. She’s shared the squared circle with Kenia Enriquez, Heather Hardy (twice), Mariana Juarez, Lourdes Juarez, Alesia Graf and Rosalinda Rodriguez. The well-traveled Bosques fought all across the world including bouts in Mexico, New Zealand, China, India and various US cities. The Las Vegas-based Hoy turned pro in 2002 and battled legendary Alicia Ashley, Monica Lovato, Yazmin Rivas, Katy Castillo, Heather Hardy and Tyrieshia Douglas. Fire Fist Boxing’s card also features five all-Florida match-ups. Arcadia’s Joseph Fernandez, 7-3-3 (1 KO), will swap punches with Tobias “Da Truth” Green, 7-2 (2 KO’s), of West Palm Beach in a junior welterweight matchup while 5-0 welterweight prospect Ramon De La Paz of Wesley Chapel battles Orlando’s Javier Garcia. Junior middleweight knockout artist Ozodbek “Bomber” Aripov of Fort Myers puts his 3-0 record on the line against Miami’s Clifford Gray Jr., heavyweight Jose “The Dream” Medina of Tampa faces Miami native Hector Hodge and Tampa junior lightweight Armando Moran squares off with Miami’s Benny Rodriguez Jr.
All bouts are scheduled for six rounds except Moran-Rodriguez, which is a four round contest. Argentinian imports Marcos Escudero, 4-0 (3 KO’s) and Alberto Palmetta, 8-1 (4 KO’s), will also appear against opponents to be named.